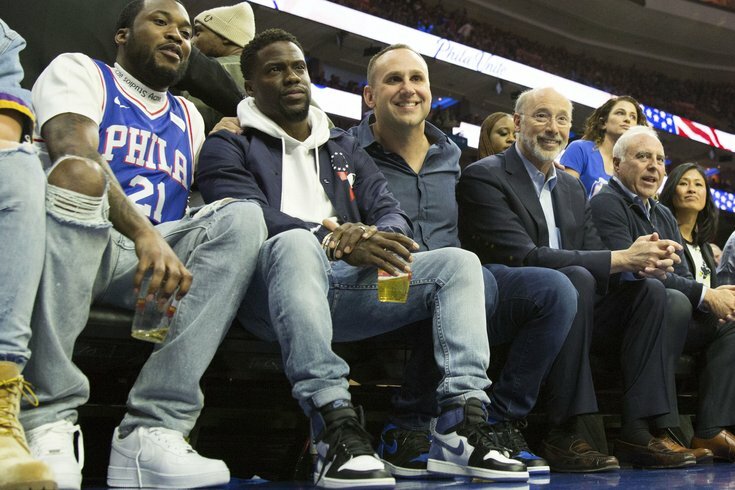 Musical recording artist Meek Mill (from left to right), actor Kevin Hart, Philadelphia 76ers co-owner Michael Rubin, PA governor Tom Wolf and Philadelphia Eagles owner Jeffrey Lurie look on during the first quarter of game five of the first round of the 2018 NBA Playoffs against the Miami Heat at Wells Fargo Center. Philadelphia 76ers co-owner Michael Rubin's Fanatics Retail Group, a license sports merchandiser, was sued Tuesday for racial discrimination by an employee who alleges he was called the n-word on his first day of work and denied a promotion on the basis of his race. The lawsuit was filed by the Equal Employment Opportunity Commission on behalf of Vincent Perkins, an employee hired to work in the screen room department out of the company's Jacksonville, Florida headquarters. The lawsuit alleges the company "subjected [Perkins] to a hostile work environment, denied him a promotion, retaliated against him, and subjected him to disparate treatment on the basis of race." In the suit, Perkins alleges that he either heard directly or was made aware of several egregious comments made against him, including — "I mean can you read? I’m not racist but a lot of you [black] guys can’t read," and "Africans in Europe know their place, but not in the United States." The company responded to the allegations. Perkins repeatedly complained to other staff and the Human Resources department about the treatment of the black employees, the suit contends. When he started his job at Fanatics, he was promised a promotion to screen lead supervisor, however after he complained, Perkins was told "he would never be promoted," according to the complaint. After reporting the discrimination, Perkins allegedly was subjected to even more harassment in an effort to get him to quit, the lawsuit said. Employees would often falsely write him up, discard his write-ups of white employees and try to slow down his work, the lawsuit alleges. The suit also details ways in which white employees were given perks, as compared to their black colleagues, who in most cases held the same-level position as white employees. The suit includes a statement made by an operations administrator at Fanatics: "The way these people at this company are treated is deplorable! If you’re white and they consider you one of their own, you can do no wrong ... sadly, if you are a minority, you are treated like uneducated slave labor." Rubin, known for his friendship with Philly rapper Meek Mill, purchased the company in 2011. Forbes puts Rubin's net worth at about $3 billion.